iPage Review 2019 - Is iPage Hosting A Reliable Web Hosting Service? iPage has been around for more than 10 years. Back then it wasn’t very well known till it relaunched in 2009. iPage also belongs to the EIG Group of Companies – Endurance Management Team – a big group that owns over 10 different hosting companies. They have made a name for themselves as a successful hosting company in the industry, chiefly because of their very low hosting fees. After relaunching in 2009, they became very popular in a space of just 2 years. In this iPage review, we’ll take a look at why they are the best website hosting for your business. Also, what sets them apart from the rest of the hosting providers, in terms of hosting packages, pricing structure and features they provide. Using iPage? Add Your iPage Review! iPage has also palmed in a positive point by being one of the few hosting companies recommended by WordPress.org. iPage’s hosting plans have a focus on WordPress specific features, to cater for the host of people that build their websites on this popular platform. They are considered one of the fastest and most secure web hosting companies around and since security is a great deal to any business or individual dealing with the internet, we’ve decided to write this comprehensive iPage review to highlight the main benefits and features that they provide. iPage possess a number of plus points that make them stand out from the rest of the hosting companies in the industry. The first and most vital one is their Price. They are without a doubt the cheapest web hosting service available. After having gone through quite a number of web hosts, I came to the conclusion that most Shared hosting service providers include the same packages in their deals. These might be a couple of the following: a free domain name, unlimited bandwidth, unlimited storage, email facilities, great support, security and so forth. Support might include industry standard uptime, top-notch customer support from the US…you understand the drift. Since most deals are uniform throughout the industry, it’s a big plus to get these at a hugely discounted price. Taking into consideration of course that the host maintains proper uptime and keeps providing excellent support. This might be hard to believe, but iPage is one of those web host providers who is dirt cheap, yet offers an excellent service, with great features. I know I’ve mentioned the fact that iPage is really cheap, plus they offer iPage Coupons. But, let’s drill down to see just how much of a money saver this web host is. Average prices for web hosting are in the range of $3 to $50/ per month. However, for an unspecified amount of time, you are able to host your websites for just $1.99/ per month. Yes, that’s right. Just $1.99. Are any of the features removed, you might ask. No. Everything is as specified above, still for $1.99/ per month. This is extremely cheap. Even if you are on a low budget. I am of the opinion that, when testing out the waters, you have to go for the basic plan of any web host, unless you know exactly what it is you want, and you have the funds for it. Other than that, stick with the basic plan. After a while, you’ll know whether you ought to upgrade or move your site to a new web host. Really, as easy as that. However, once your contract expires, your cost will increase to $8.99/per month. Good grief. That’s a massive 300% jump from the initial $1.99. Since iPage belongs to EIG, it carries with it and enjoys the A+ ratings that EIG has with the Better Business Bureau. Because EIG is accredited by the BBB, it will at all times strive to handle complaints from customers in a professional fashion. This will ensure that iPage will at all times handle your case with the utmost professionalism (should any such case arise). According to reports, iPage easily records 100% uptime over a 30-day period. I must say, that’s a good figure, taking into consideration how poorly some web hosts fare. Just remember that iPage is by no means the perfect web host. There has been downtime recorded as well. In the industry, a 99.99% uptime is considered normal. While 100% uptime is great. When 100% uptime is sustained over a long period of time, only then is it considered excellent. Over a period of 12 months, iPage recorded an average of 99.75% uptime. Though the difference in these figures appears small what they actually mean can be quite alarming, especially when your bread and butter depends on your uptime. Some web hosts will promise you your money-back should you not be happy, but come payment time you have to sweat to get it out of them. This is why you should read all information availed to you before you sign any forms. Remember, the catch is always in the small print. iPage promise you 30-day money-back guarantee, which is the industry standard. In their effort to contribute towards sustainable and renewable energy, iPage buys RECs. What are RECs? According to Wikipedia, REC’s are Renewable Energy Certificates. They also go by the names of Tradable Renewable Certificates (TRC’s) or Green Tags, amongst the many. These certificates, which are also tradable commodities, serve as proof that 1 megawatt-hour of a company’s energy was generated from a renewable energy source. Electricity bought this way, can then be fed into the grid and as such, this makes iPage a green energy web hosting provider. Although not a new thing amongst web hosting companies, advertiser credit is a nice feature to make use of. With this hosting provider, you get Bing search credit of $100 and Google Adwords credit of $100 (US only) as well as a free listing of your business in the Yellowpages. Now, you might not need all these things when you’re starting out and to be honest if you don’t know what you’re doing, this can be quite distracting, but it’s a good thing to know that you have them. You also get a free shopping cart software called Shopsite. This software is easy-to-use and is ideal for small to medium businesses. Another useful feature is their WordPress 1-click installation. If you’re new to this whole WordPress thing or just don’t feel comfortable with databases and such, then this will be a lifesaver for you. Just to remember though that it’s always useful to learn how to do a manual installation of WordPress. It will allow you to set your own database usernames and passwords. The problem with going with 1-click installs is that these are allocated to you. You also get Sitelock with your package. Sitelock will help you find malware, but not just find it, it will also help you fix them. According to testimonials and reports, their service is quick and they are fast to answer your questions. Tech personnel are constantly ready to help and give instructions in a step-by-step manner. This is great since with many other web hosts there is a constant struggle to get hold of tech personnel. Whenever I have to deal with any company and need an answer quick, I’ll always opt for a live chat. With live chat, you are ensured of answers immediately. Well, almost always. With iPage, live chat will help you with minor issues you’re having. Things like, how to change a particular setting, or helping you when you don’t know where to click or get a particular feature. Should you have problems with advanced issues, the best way to go about it is with a support ticket. iPage will normally respond to your support ticket within 24 hours of getting it. In another case though, when there are server outages they will respond much faster than 24 hours. iPage has one Shared hosting plan called the Essential Plan. It costs $1.99/ per month when signing up, but eventually will cost you $11.95, once the contract expires and you need to renew. You get unlimited everything with their plan: That is unlimited storage space, unlimited bandwidth, you can host unlimited domains and set up unlimited databases. Apart from that, you also get a Free domain for a year, a number of apps, customizable spam filters, and a site builder. You get a free Weebly website builder. Don’t despair, you don’t have to know how to code as you’ll also be presented with templates to modify and have a stunning looking website. For higher security, you can choose to upload your files via FTP. Looking For iPage Shared Hosting? WP Starter costs only $3.75/ per month. With this plan, you get a customized control panel, plugins that are pre-installed and ready-made themes. WP Essential is priced at $6.95/ per month. It comes with everything included in the Starter plan. Also, it utilizes better infrastructure to enhance the speed of your site. With each of these plans, you get FREE domain registration, Free marketing credits, Unlimited storage space, scalable bandwidth, 24×7 WordPress expert support and 30-day money-back guarantee. iPage VPS hosting include fully managed support, easy-to-use cPanel, Cloud-based flexibility for seamless migration, 24×7 expert support via phone, chat or email and 30-day money-back guarantee. This plan is available in 3 packages and is well-suited for mid-sized & large enterprises. Priced at $19.99/ per month, with the Basic plan, you get 1GB RAM, 1TB Bandwidth, 40GB Storage, a Free IP Address and a Free Domain. This plan offers you 4GB RAM, 3TB Bandwidth, 90GB Storage, 2 Free IP Address and a Free Domain at a cost of $47.99/ per month. Starting at $79.99/ per month, this plan comes with 8GB RAM, 4TB Bandwidth, 120GB Storage and offers 2 Free IP Address and a Free Domain. Along with each of this plan, you also get FREE Marketing Credits, personalized email addresses, Unlimited sub-domains, databases & FTP accounts, spam protection via SPAM Assassin and pre-installed PHP, Python, Ruby on Rails and other scripts. Looking For iPage VPS Hosting? iPage has also palmed in a positive point by being one of the few hosting companies recommended by WordPress.org. iPage’s hosting plans have a focus on WordPress specific features, to cater to the host of people that build their websites on this popular platform. iPage Dedicated Servers provide faster-operating speeds for high traffic sites along with enhanced security, mirrored storage for advanced data protection and the ability to install applications without restrictions. Like VPS hosting, this plan also offers fully managed support, easy-to-use cPanel and Cloud-based flexibility for seamless migration. In addition, it offers scalable resources & payment term options. The Dedicated plans also come in 3 packages namely, Startup, Professional, and Enterprise. This plan offers 4GB RAM, 500GB Storage space, 5TB Bandwidth, 3 IP Addresses and a Free Domain at a price of $119.99/ per month. Costing $151.99/ per month, the Professional plan comes with 8GB RAM, 100GB Storage space, 10TB Bandwidth, 4 IP Addresses and a Free Domain. The Enterprise plan is priced at $191.99/ per month and provides you with 16GB RAM, 1000GB Storage space, 15TB Bandwidth, 5 IP Addresses and a Free Domain. Other features included with Dedicated Server packages include Unlimited sub-domains, databases & FTP accounts, pre-installed PHP, Python, Curl and other scripts, spam protection via SPAM Assassin, personalized email addresses and FREE Marketing Credits. Looking For iPage Dedicated Hosting? The biggest benefit of choosing iPage for your Domain registration is the wide variety of Domain extensions that are available. iPage offers Pre-Registration for General Availability, this means you can pre-register your desired domain, which will increase your chances of securing the domain name you want. Best part, your pre-registration fee is fully refundable if iPage is not able to secure your domain. .online domain price value is $4.99/ per year. The renewal cost is $30/ per year and duration term is set at 1-year. .ngo domain name registration is priced at $46.99/ per year. The selective duration is 1-year and the renewal price remains same at $46.99/ per year. .club domain cost $9.99/ per year. The renewal is priced at $20.99/ per year and the selective duration term is minimum 1-year. .website domain extension will cost you $1.99/ per year. The minimum selective duration you can register it for is 1-year and the renewal will cost you $20/ per year. .blog domain price value is $29.99/ per year. The renewal rate remains the same at $29.99/ per year. The minimum term for registration is 1-year. .tech domain name registration is priced at $4.99/ per year. The renewal cost much higher at $45/ per year and the selective duration for this is 1-year. .wiki domain extension cost $36.99/ per year. The renewal charges remain the same ($36.99/ per year). The duration is set at 1-year. .store domain name starts at $9.99/ per year. The duration for this is 1-year and the renewal charges are $50/ per year. .academy domain registration and renewal is priced at $33.99/ per year. The minimum term is set at 1-year. .careers domain name will cost $55.99/ per year. The renewal remains same at $55.99/per year with a minimum term of 1-year. iPage also offers Email hosting packages which include G Suite and MS (Microsoft) Exchange. Both these services are priced at $5/ per month (G Suite) & $12.95/ per month (MS Exchange) and come with a host of exciting features. All Email hosting plans include spam & virus protection, email, calendar, contacts and task management, secure webmail access from anywhere & at any time, 99.9% guaranteed uptime and 24/7 support. Priced at $5/ per month and billed annually, with this package, iPage offers easy account setup, email migration, personalized Gmail at your domain, instant domain verification, 24/7 dedicated support via phone and much more. Not to forget the amazing benefits that you can available that are a part of G Suite by Google such as 30GB storage, Google Drive, instant access to all your files etc. Starting at $12.95/ per month and billed annually, with this plan, you get Free desktop licenses. It also allows you to automatically sync your emails, contacts, and calendar with your smartphone. Plus, you can access your entire emails, contacts, and schedule from any location, any time you want. Additionally, this plan comes in 3 packages: Exchange Basic, Exchange Plus and Exchange Premium, wherein the first plan – Exchange Basic will cost you $12.95/ per month ($155.40 billed for 12 months), the Exchange Plus is priced at $215.46/ per year and the Exchange Premium starting at $377.46/ per year. Looking For iPage Email Hosting? When you sign up for iPage, they’ll give you the option of a free domain, plus a 30-day money-back guarantee. Yet, should you ask for your money-back within those 30 days, they will deduct a $15 for the domain they gave you for Free. 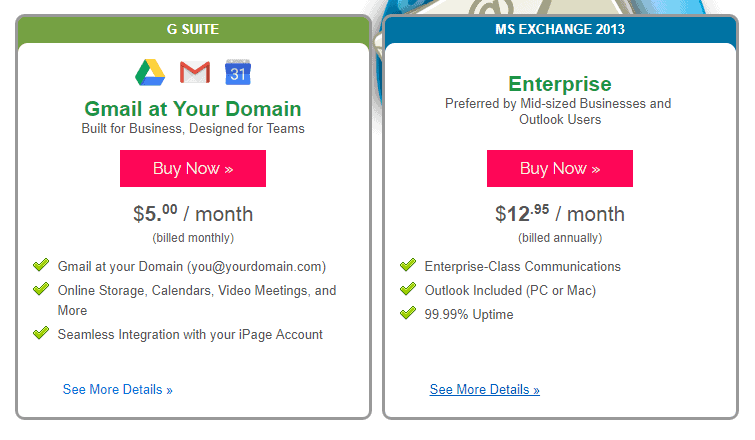 Domains these days cost about $8 if you wait for the right time, but even if not, you can still expect to pay less than $10 for one. About all the different web hosts I’ve tried use cPanel. cPanel is easy, user-friendly, familiar and just generally a nice web host interface to work with. Yet, iPage uses vDeck. Why on earth they do, I do not know. This makes it hard for first-time users to get general information about a problem they’re experiencing. Page loads at iPage aren’t the best either. Their page loads are much slower than the normal average. This is not considered very good taking into consideration that the speed of your site impacts your SEO. What this means is that a slower loading website contributes to a lower ranking. Lower ranking means that you will not get many visits to your site, which results in further lower ranking. This is a vicious cycle that can only be remedied with fast uploads. Another bad thing regarding slow page loads is that clients will leave before pages have completely loaded. No one wants to wait for web pages to load. If your site takes longer than 3 seconds to load, then expect that about 45% of your visitors might leave. CloudFlare integration – a massive plus point for faster web presence. Backups of all your content automatically. Choose your own server location. The Storage space offered with the hosting plan is too low. The Bandwidth is minimal in comparison with other hosting providers. Have to commit to a year of shared hosting plans. Only Linux servers, no Windows server solutions. Should you make use of their service? Well, iPage is really cheap. Their support is okayish and they have partnered with Sitelock, which is great for the security of your site. But, their uptime is not so good in comparison with other hosting companies. Page loads are also on the draggy side. Something you can’t afford if you’re running a real web business. So, what are the other options? Well, there is no lack of affordable web hosting companies. Few that are known for their uptime and customer support are; Bluehost, SiteGround, InMotion and WPEngine. If you want to check them out before making a decision, then here are the reviews of each for your reference. iPage offers you the unlimited package: unlimited storage space, unlimited bandwidth, unlimited domains etc. Beware though that unlimited does not always mean unlimited. At times when you go over a particular set amount of usage that will encroach on other users of the same server, your account might get suspended. If you want to host more than one domain, this web host might be great for you. With 1-click installation, it makes it even easier.